The future prospects for Alzheimer’s disease look bleak. In developed countries, much research is being done into the origin of the disease, but there is very little progress. At the same time the number of cases is increasing dramatically. The cause of this is ageing. There is proportionally much less research being done into the present and future living conditions, than the onset of Alzheimer’s disease. The number of Alzheimer homes is likely to multiply over the next decade, giving the prediction of a massive increase in patients. In addition to the well-tried prosthetic approach, an Alzheimer home should ideally contain three components: healing architecture, a more human approach to resource management and leading edge electronic surveillance and artificial intelligence. The aim of the research into ‘Alzheimer and Architecture’ for the health care sector is to provide insights into ‘healing architecture’ regarding accommodation facilities for this specific health care sector; Alzheimer institutions, or stay-at-home environments. We have to take into account the various types of provisions, requirements, issues and legislation relating to health care, as well as the various building typologies and associated requirements, so that these insights can be translated into safe environments. The growing intercultural societies also make other demands on the design of health care institutions and stay-at-home environments. 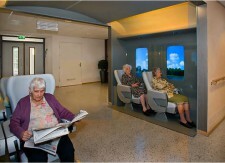 The changing perspectives on the care needs of Alzheimer patients also influences the design concept. People live longer and stay healthier longer in absolute terms. The elderly want to control their own lives and that includes being able to continue living in the house where they have often lived for years, and feel at home. The right environment for an Alzheimer’s patient can facilitate their mental responses while improving their physical health. However the opposite can also be true. In residences where the setting is counterproductive, mental and physical conditions can deteriorate. How do you translate the sometimes-conflicting interests of the care provider and the patient into a sustainable and wholesome design? What became clear is the vulnerability of dementia patients. Alzheimer’s affects so much more than just distortion of memory. It is the disintegration of all structures and patterns that make up our lives, a point where all components become entangled, diffusing the overall composition. To develop an appropriate narrative for future living conditions of Alzheimer’s patients is to take this vulnerability into account. What does a safe environment of an Alzheimer’s patient look like in the future? With this research Henri Snel, Architect, lecturer and researcher would like to contribute to the discussion on the disease in general and generate possible solutions for improving the living conditions of Alzheimer patients in the future. I propose an investigation into ‘haptic architecture and tactile senses’ from an architectural perspective. I believe that the Alzheimer patient needs a more sensory related space. The patient often loses contact with the outside world, they become more and more dependent on their primary senses. This implies the need to restore a more intimate relationship, as they are thrown back to sensorial perception as communication. Ashley Montagu, anthropologist and humanist, wrote: ‘the skin is the oldest and the most sensitive of our organs, our first medium of communication, and our most efficient protector. Touch is the parent of our eyes, ears, nose, and mouth. It is the sense that became differentiated into the others, a fact that seems to be recognized in the age-old evaluation of touch as ‘the mother of the senses’. Haptic architecture is sense triggering. Architecture articulates the experiences of being in the world and strengthens our sense of reality and self. Alzheimer patients especially, need bodily experiences so as not to feel alienated and confused but to create a safe environment that can still enrich every day life. Henri Snel was confronted with Alzheimer’s disease more than a decade ago when his mother was diagnosed with the illness. He has since become engaged with the illness and its consequences. This resulted in a series of research projects into the living conditions of Alzheimer’s patients from his professional Architectural viewpoint, often involving students from different educational institutions. Henri Snel is Architect, Interior Architect and lecturer at different institutions in the Netherlands. He is head of the Bachelor programme ArchitecturalDesign at the Gerrit Rietveld Academie and the Master programme Interior Architecture at the Sandberg Institute. Since October 2010 Henri Snel is member of the academic group with the research topic: ‘Alzheimer and Architecture’ of the Lectoraat Art & Public Space (LAPS).